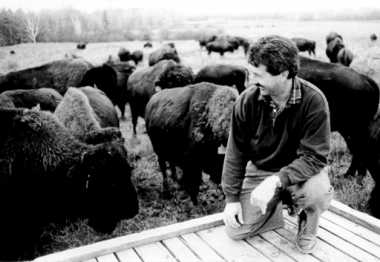 For Pierre Bélanger, our founder and owner, the adventure started in 1972, with a novel idea for the time: why not turn rugged Ontario farmland into a bison ranch? 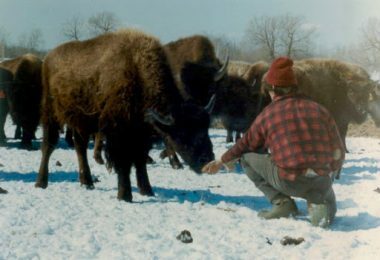 Buying the first few bison was relatively easy compared to all that needed to be accomplished over the next 45 years. Today’s strong and healthy herd of 250 animals is a testament to Pierre’s vision and business acumen. We're proud to say that we are among the oldest in Canada, and the largest in Eastern Canada. And we’re just getting started! From one generation to the next, we’re passionate about what we do and we love to talk bison! Raising a family of five on the ranch not only made for great stories - it also inspired the kids to get involved. Now working on the ranch side by side, Pierre and his son Charles make an unstoppable pair. Both are committed to the well-being of bison and share a love of nature, hard work and adventure. 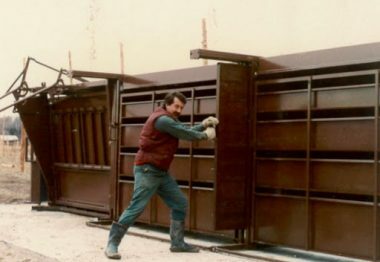 As a pioneer in the bison industry, Pierre helped establish the Canadian Bison Association and the Ontario Bison Association a few decades ago. It all took hard work and dedication, but working alongside fellow Canadian producers and helping to further the industry have continued to fuel his passion for everything bison. We are proud to support the local food scene, on both sides of the border, and enjoy meeting those who are curious about bison. Every summer, for the past 15 years, Bison du Nord has been a popular and tasty stop for the thousands who attend the Foire gourmande de l’Abitibi-Témiscamingue et du Nord-Est Ontarien, in Ville-Marie, Que. We even earned the People’s Choice Award in 2016, thanks to our delicious BBQ bison slider.